Dharmasastra has been a discipline comprising the vast range of subjects related to regulations on ethics, social and moral behavior, administration, laws of inheritance and various other issues related to diplomacy and polity. 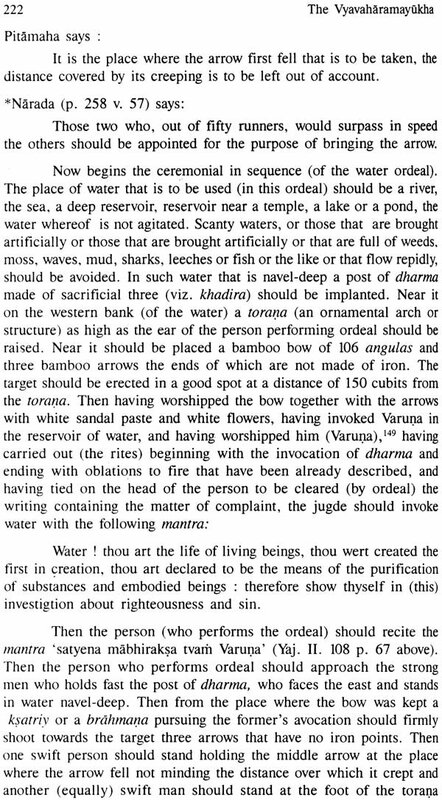 The tradition of Dharmasastra developed through the hundreds of texts like Dharmasutras and Smrtis. 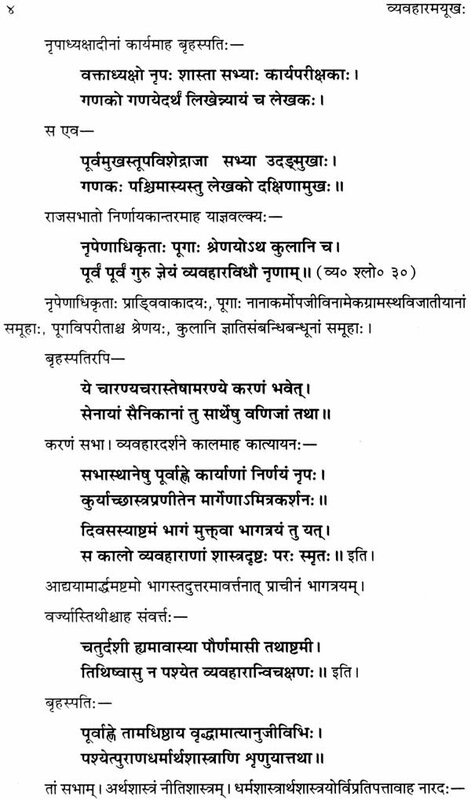 Yajnavalkya in his Smrti has noted ten major authors of Smrtis, but Vtramitramisra, the author of Vtramitrodaya has enlarged the list by citing many other Smrtis, Apart from the authors of Dharmasutras and smrtis, commentators like Visvarupa, Medhatithi, Vijfianesvara, Kulu kabhatta and a host of other also have made original contributions to Dharmasastra. Vyavaharamayukha is a part of Bhagavantabhaskara, one of the most voluminous encyclopedic works on Dharmasastra, Nilakantha Bhatta, its author was great Mimamsaka. He was protege of Bhagavantadeva, a ruler of Bhareha (presently in Etawa Dist. of U.P.). Mahamahopadhyaya Purushottam Vaman Kane has placed him around 1610-45 AD. 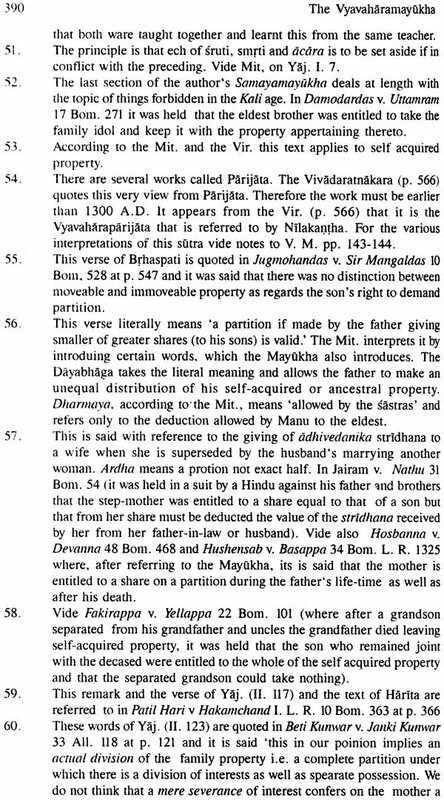 Nilakantha Bhatta compiled this voluminous text at his instance. 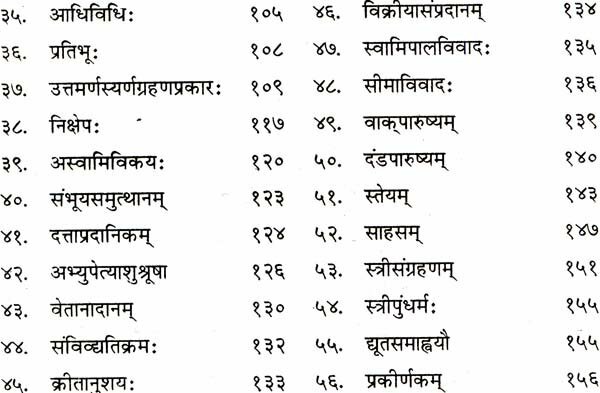 There are twelve Mayukhas (chapters) in Bhagavanta-bhaskara, They deal with various topics related to Dharmasastra viz. 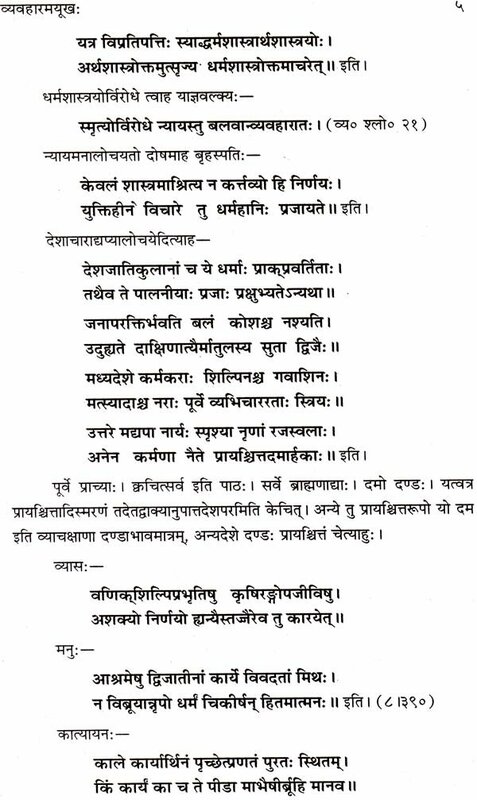 - the Samskaras, Acara, Samaya (calendar), Sraddha, Niti (Polity and administration), Dana, Utsarga (Public welfare activeities), devapratistha, Prayascitta, Suddhi and Santi Out of these twelve Mayukhas in Bhagavantabhaskara, the Vyavaharamayukha is the sixth one. It is a valuable treatise on legal issues, covering, important facets of Ancient Indian Economy, administration and rules for inheritance. - Nilakantha Bhatta is not only an authority on Dharmasastra, he has culled the essence form hundreds of ancients Smrti text, to make his work a valuable compendium. 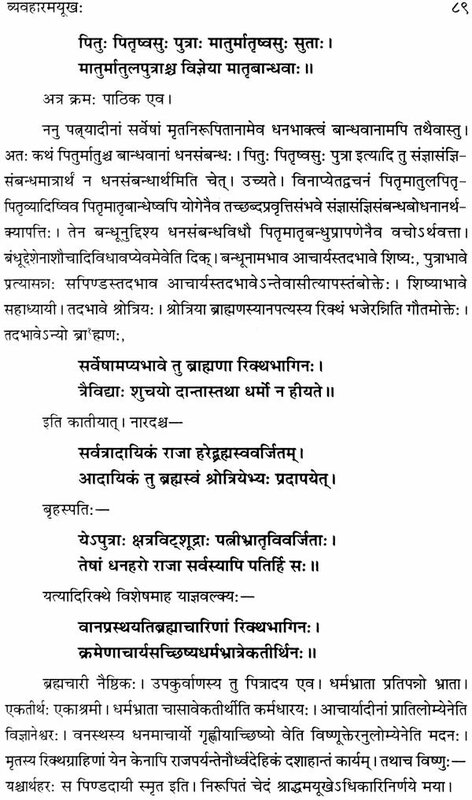 It is thus not only an essential reading for the students of Sanskrit - particulary that of Dharmasastra, it is also very useful for legal practitioners, sociologists and researchers in Ancient Indian History and Culture. 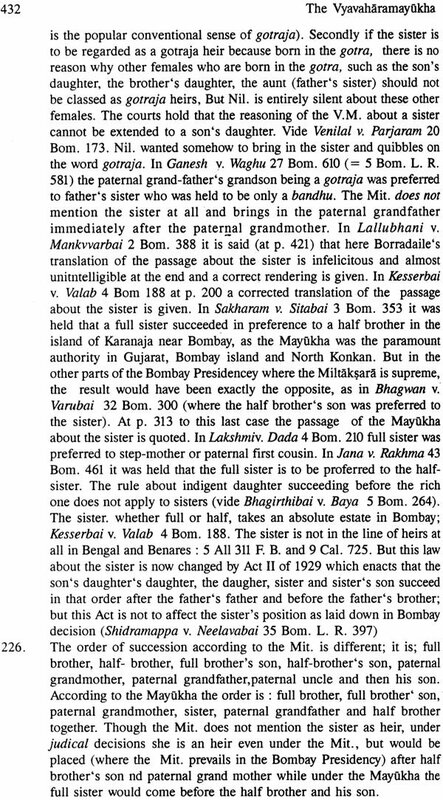 Also, Nilkantha Bhatta is not just a compiler. He has given his orginal views and interpretations on a number of debatable issues. The text has been printed a number of times, but it has not been published with English translation. Mahamahopadhyaya Purushottam Vaman Kane recognized the importance of this work for the first time and he translated it into English. His translation published in 1993 is not easily available now. We are happy to bring out the text and translation together for the first time. We hop that this new edition of Vyavaharamayukha will be useful for academic world. 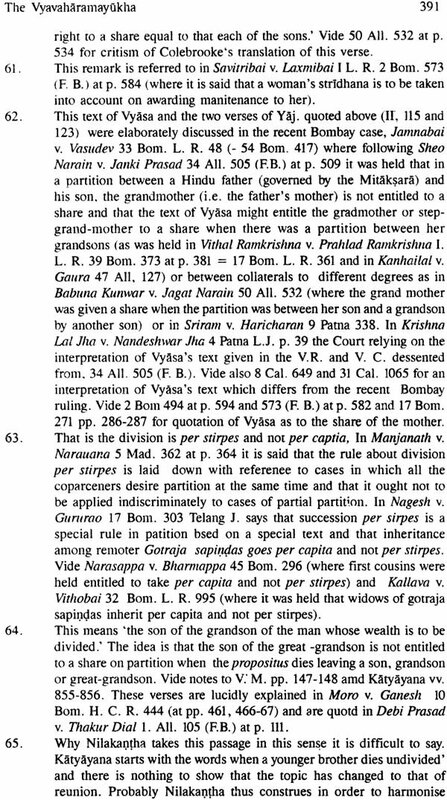 The Vyavaharamayukha of Nilakantha is a work of paramount authority on Hindu Law in Gujerat, the town and island of Bombay and in northern Konkan. Even where, as in the Maratha country and in the District of Ratnagiri, the Mitaksara is the paramount authoerity, it occupies a very important, though a subordinate place. 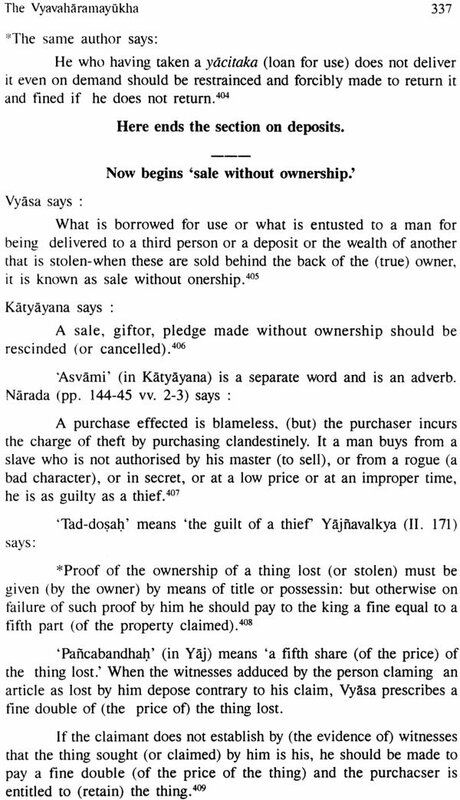 The first English translation of the Vyavaharamayukha was published in 1827 by Borradarle. Considering the state of Sanskrit scholarship among Westerners more than a hundred years ago the translation was a creditable, performance. 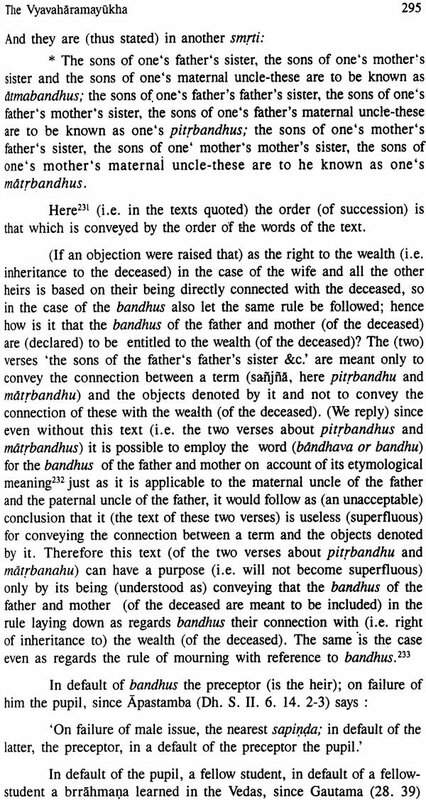 But, as, has been judicially noticed, Borradaile’s translation is in many places infelicitous, obscure- or positively wrong.” Besides, Borradaile’s method of dividing the translation into chapters, sections and placita, though convenient to judges and lawyers for purposes of reference, conveyed to those unacquainted with the Sanksrit language or the original work the worng impression that the original was similarly divided. 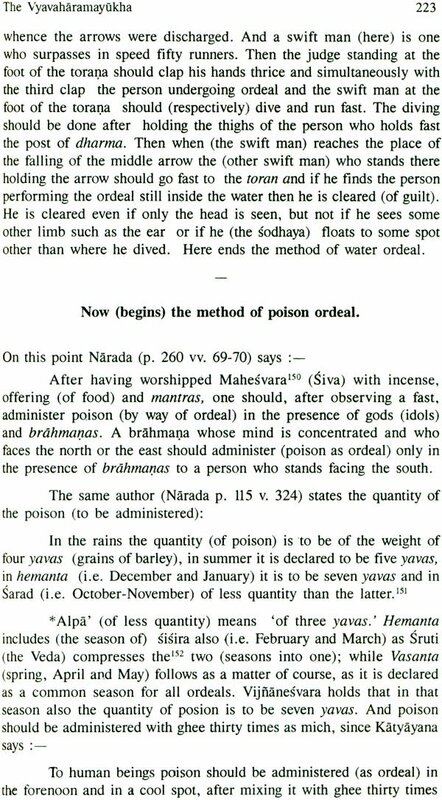 About fifty years ago the late Rao Saheb V. N. Mandlik brought out a scholarly transration of the Vyavaharamayukha, that was a great improvement on Borradaile’s work, both in the accaurcy of the translation and the method of its presentation. That work is not now available in the market. 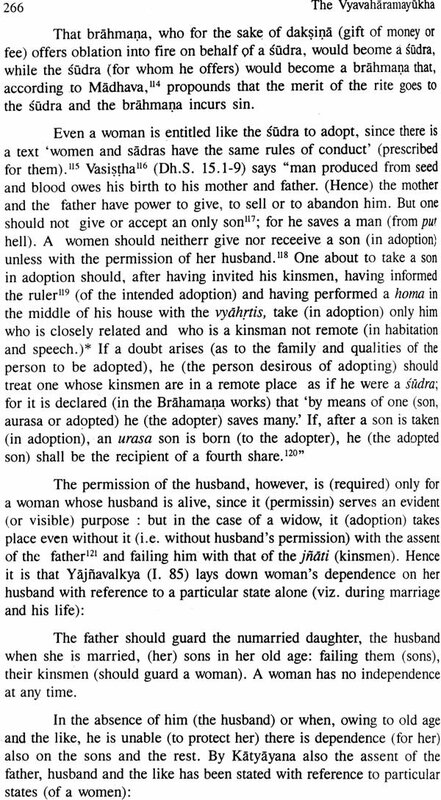 It omitted the section on ordeals, it did not refer to decided cases and was also inaccurate in some places, as a reference to the pages in dicated in the Index to this translation will show. 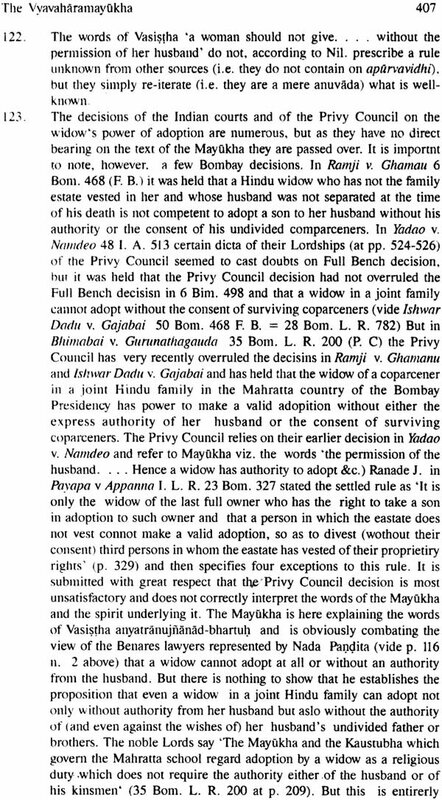 In 1924 Mr. J.R. Gharpure of Bombay, the indefatigable editor of the ‘Collection of Hindu Law Texts’ brought out a translation of the Vyavaharamayukha. In this translation he generally follows the late Rao Saheb Y.N. 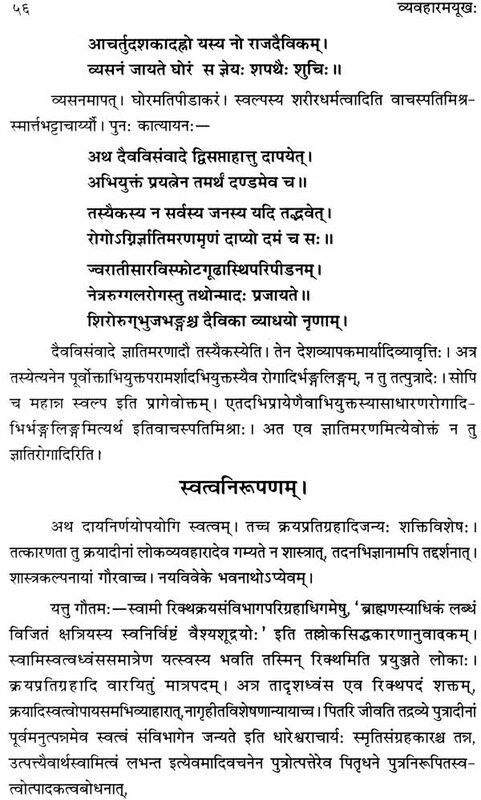 Mandlik, though here and there improvements are made; but he does not translate the section of the work on ordeals, nor does he cite even a considerable body of decisions of the High Courts that have a direct bearing on the text of the Vyavaharamayukha. 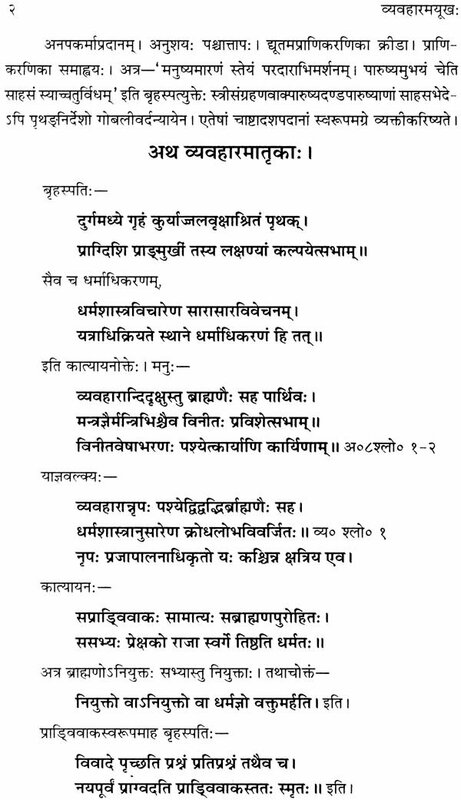 In the translation here presented, the whole of the Vyavaharamayukha has been rendered into English. 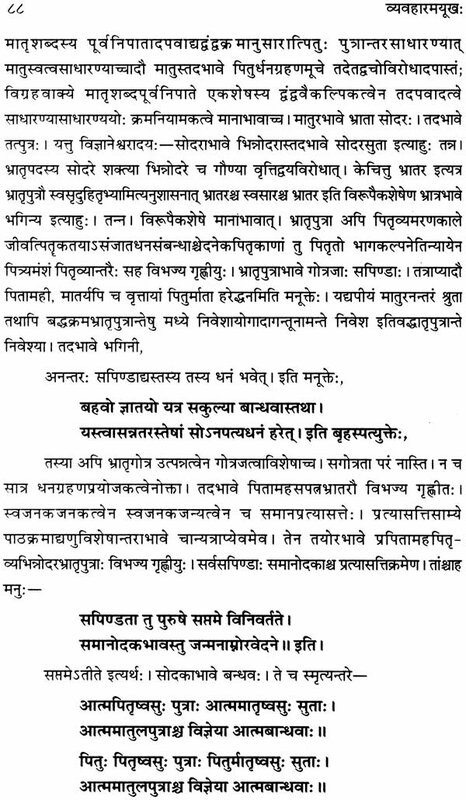 The text chosen for tanslation is that contained in the edition of the Vyavaharamyukha published by the Bhandarkar Oriental Research Institute at Poona in 1926. The pages of the text have been indicated at the bottom of the pages of the translation. 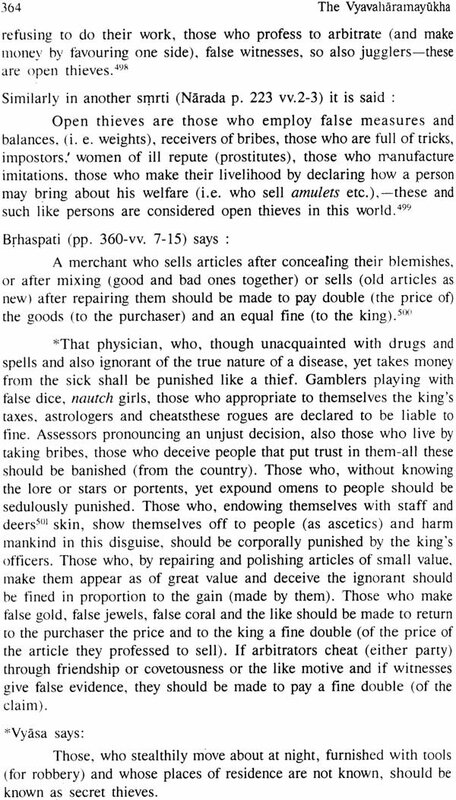 In this translation, explanatory notes have been added in order to elucidate the meaning of the author. 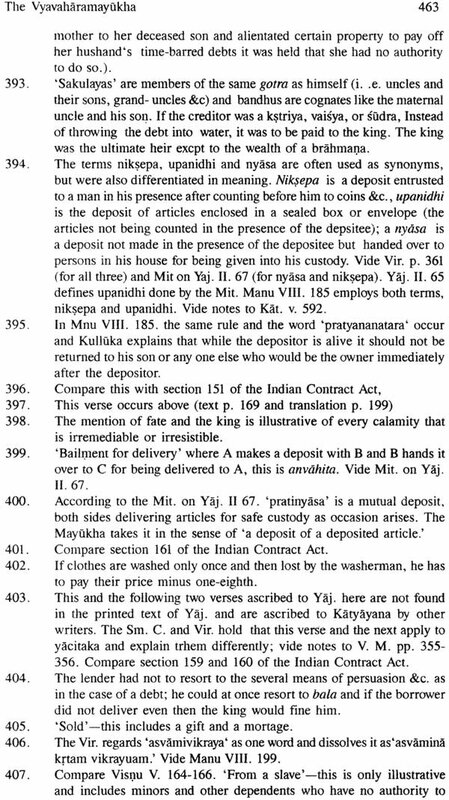 References to the pages of the notes in the Poona edition where the Vyavaharamayukha has been exhaustively annotated have also been given in appropriate places for those who want to make a deeper study of the original and the translation. 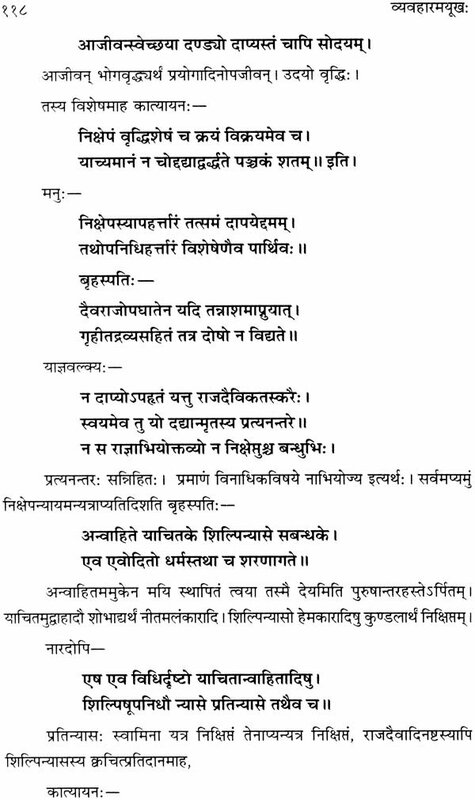 The Vyavaharamayukha is written in continuous prose, execpt where quotations in verse (which are numerous) are cited from ancient works and sages. In the present translation quotations in verse have been clearly indicated by the method of beginning them in a separate line and by lessening the size of the lines of the translation of verses by a few letter spaces as compared with the rest of the work. 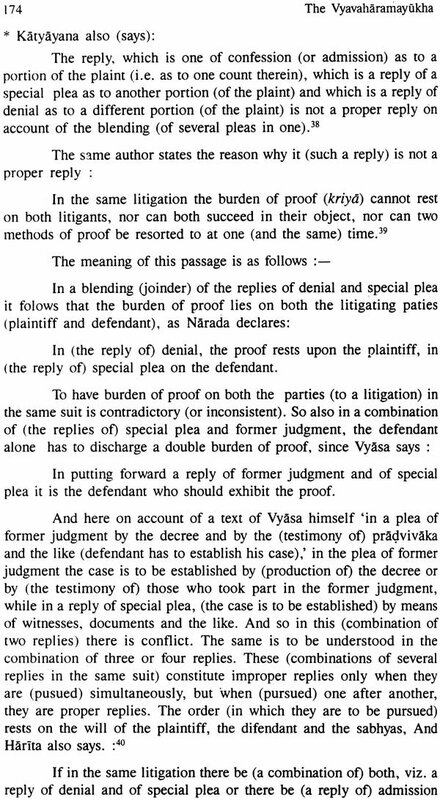 Another feature of this translation is that exhaustive citations of decided cases have been made, wherein the Mayukha has either been quoted, explained. 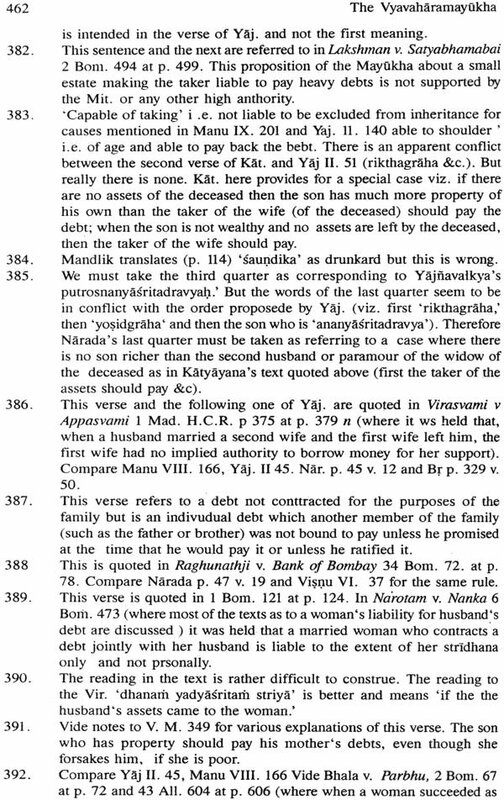 criticised, referred to or which have an important bearing on the law as laid down in the Vyavaharamayukha. The decisions of courts have in a few places been also criticized. 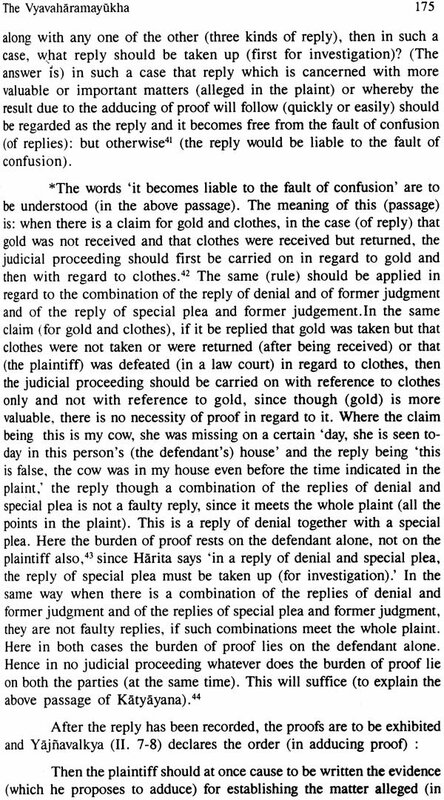 It has, however to be borne in mind that this work: does not profess to be a treatise on Hidnu Law and that, therefore, no one should expect that all possible cases on Hindu Law would be found digested herein. 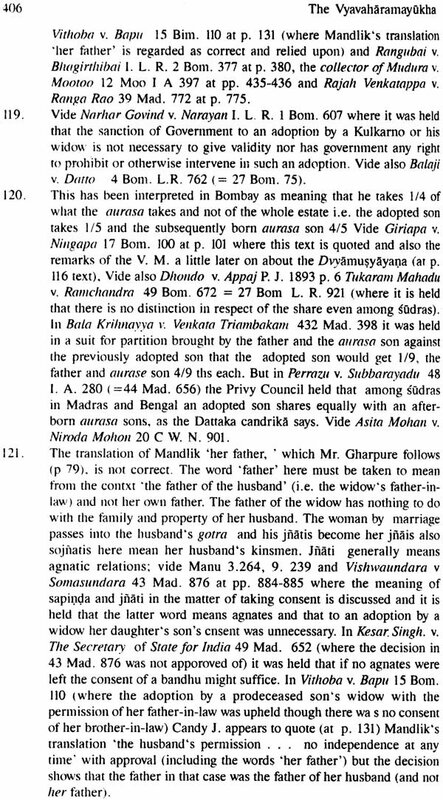 As judges and the legal profession have been accustomed for decades to use the translations by Borradaile and Mandlik and as decided cases cite quotations from and give references to these translations, in the corner of each page of this translation corresponding portions of Borradaile’s translation contained in Stokes collection of Hindu Law-books and Mandlik’s translation have been indicated with the letters S and M respectively. 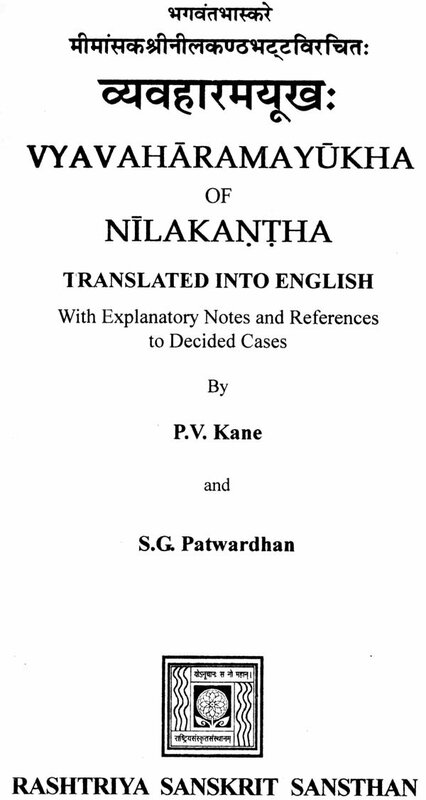 The Introduction to the edition of the text of the Vyavaharamayukha deals exhaustively with the family and personal history of Nilakantha, the works of Nilakantha, the period of his literary activity, the contents of his twelve Mayukhas which together constitute his digest called Bhagavantabhaskara, his position in Dharmasastra Literature and the position of the Vyavaharamayukha in madern Hindu Law. Those who want to make a detailed study of these matters must refer to that Introduction. 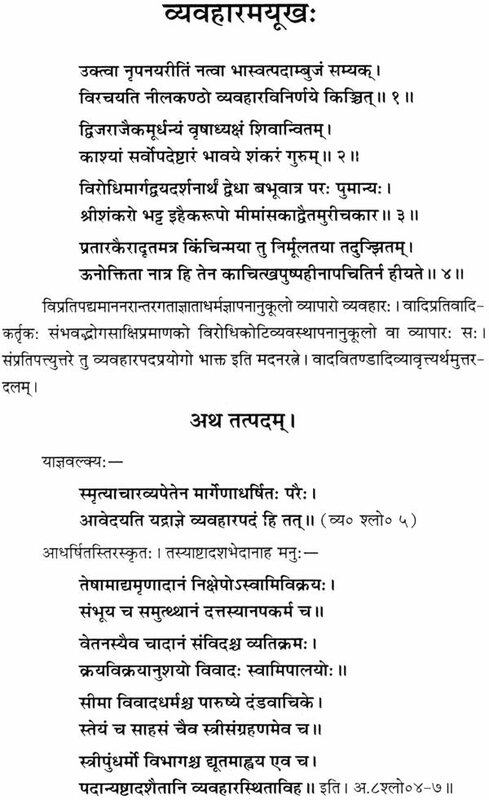 But for the benefit of those who do not know Sanskrit a brief treatment of the matters detailed above is given here. 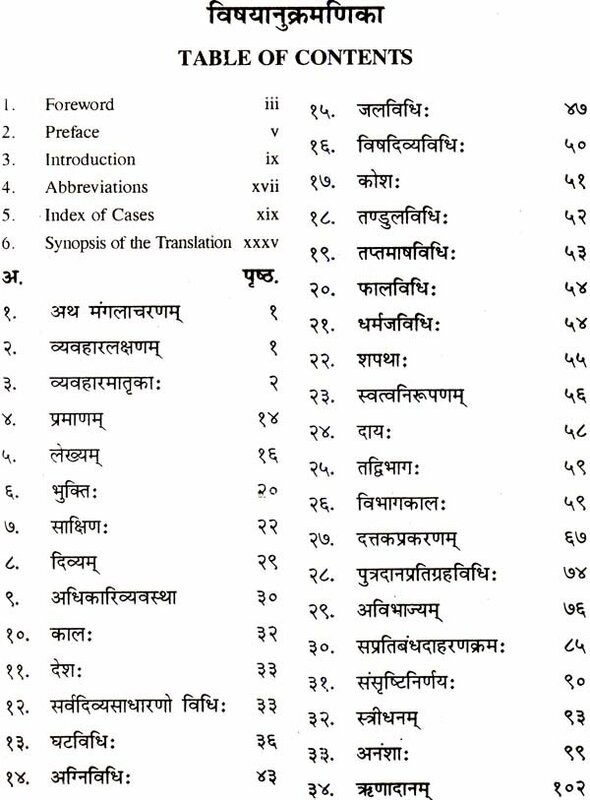 An exhaustive synopsis of contents, an index of cases and Law Reports and a general index which also contains in italics important Sanskrit words will, it is hoped, add to the usefulness of this edition of the translation of the Vyvaharamayukha. Information about the family of Nilakantha can be gleaned from several sources. Sankarabhatta, the father of Nilakantha, wrote an account of the family called. Gadhivamsanucarita. 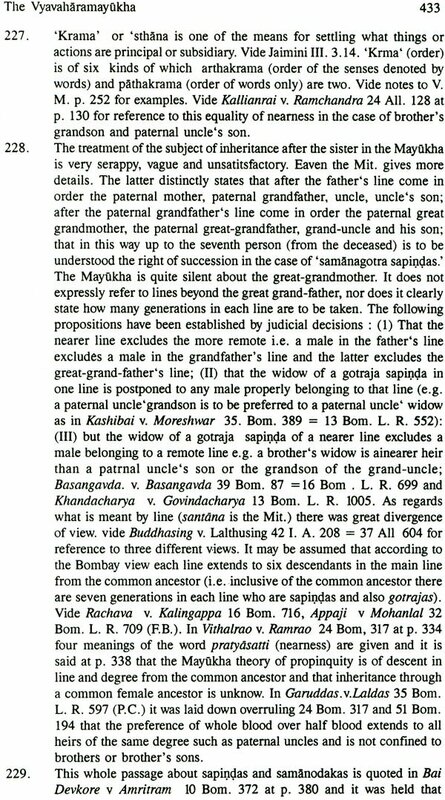 This work was so called because the gotra of the family was Visvamitra. 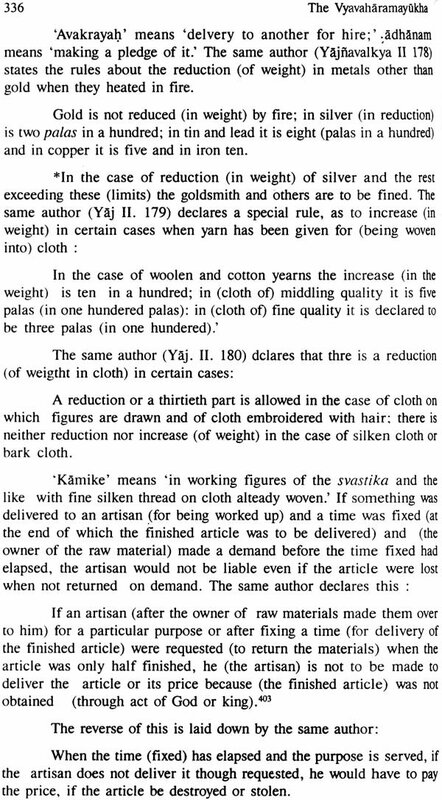 The work was ‘brought to the notice of scholars by the late Mahamahopadhyaya Haraprasad Sastri (vide Indian Antiquary, vol. 41 pp. 7-13). 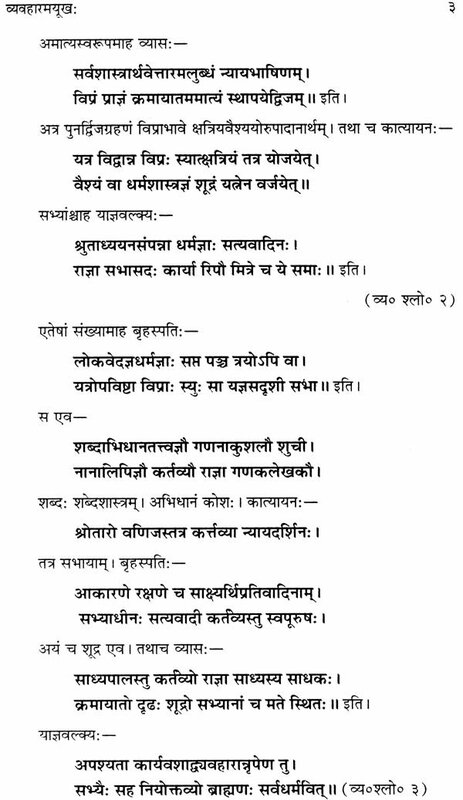 Pandit Kantanathabhatta published at Mirzapur in 1903 a poem called ‘Bhattavamsakavyam’ in ten sargas (cantos) and 409 verses, in which he gives a detailed history of the family to which both he and Nilakant ha belonged. Besides, the numerous works composed by the members of this family during the period of several centuries furnish considerable material for constructing a brief but reliable history of the family. The home of the family was at Paithan in the Deccan on the Godavari, The gotra of the family was Visvamitra or Gadhi, The most ancient ancestor named is Nagapasa or Naganatha, whose son was Cangadeva, whose son was Govinda. The real history of the family begins with Ramesvarabhatta, son of Govinda. Ramesvarabhatta was a very learned man, had numerous pupils, cured of leprosy the son of an influential Mahomedan officer of the Ahmednagar kingdom and travelled extensively. 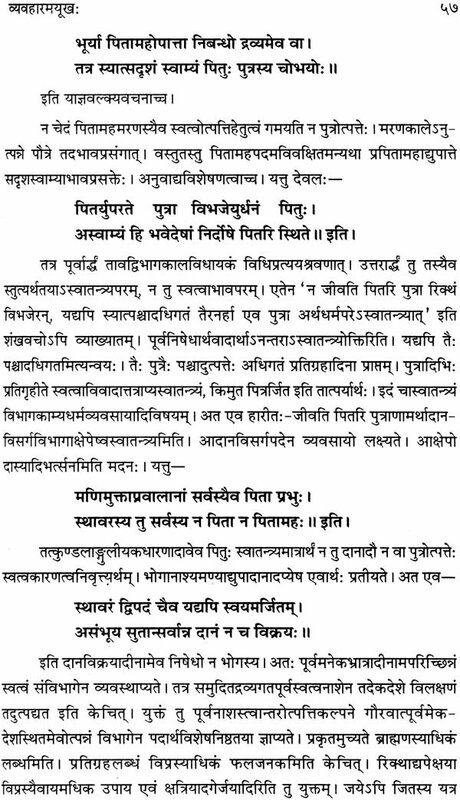 When on a pilgrimage to Dvaraka his first son Narayanabhatta was born to him in sake 1435 (1513 A.D.). Ramesvarabhatta migratd eight years later to Benares. He had two more sons Sridhara and Madhava. Ramesvara died at a: very advanced age and his wife became a sati. Narayanabhatta learnt all the sastras at the feet of his father. He vanquished Maidthila and Gaula pandits at the house of Todarmal, the famous financier, scholar and statesman in the reign of Akbar. He was [he most illustrious member of his family. He was very fond of copying and collecting Sanskrit manuscripts. He is said to have rebuilt the famous temple of Visvesvara at Benares that had been razed to the ground by the Mussalmans. For his .great learning and piety Narayanabhatta was given the title of ‘Jagadguru’ and his family was given the first place of honour in the assembly of learned brahmanas and at the recitation of the Vedas, which latter distinction, it is said, still continues in the family. Nayayanabhatta wrote the Praoyogaratna, Tristhalisetu and several other works. 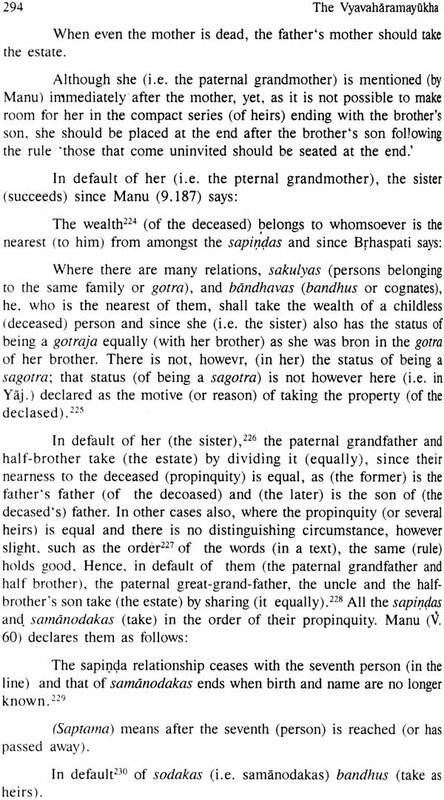 Narayanabhatta had three sons, Ramakrsna, Sankara and Govinda. Ramakrsna was a very learned man and a great student of Mimama. 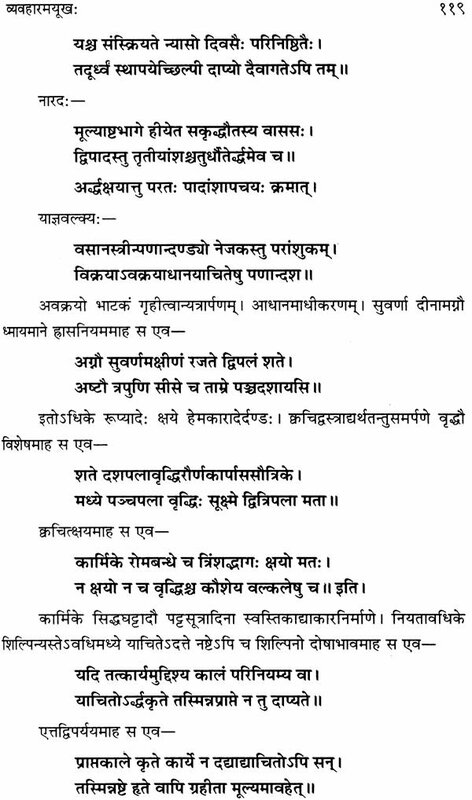 Sankarabhatta was a profound mimamsaka, He wrote a commentary on the Sastradipika, a work called Dvaitanirnaya, the Mimamsabalaprakasa, the Dharmaprakasa and several other works. Ramakrsna had three sons, Dinakara alias Divakara, Kamalakara and Laksmana. 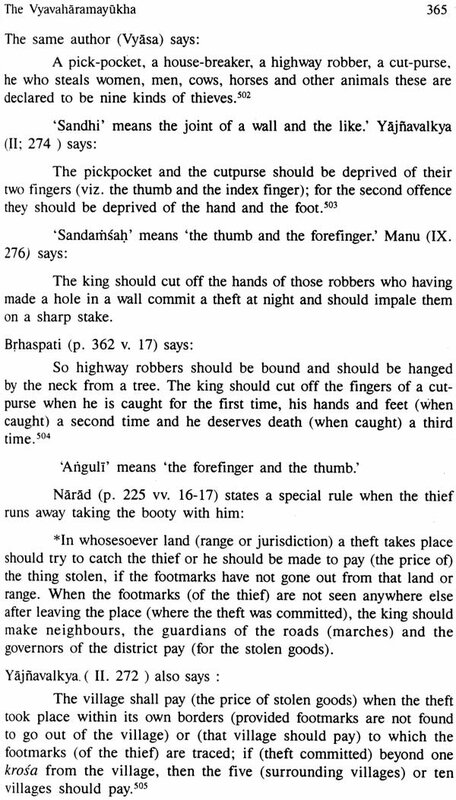 Dinakara wrote the Bhattadinakarl, the Santisara, the Dinakaroddyota.Kamalakara wrote no less than twenty-two works. The Nirnayasindhu, one of his earliest works, was composed in 1612 A.D. Laksmana wrote the Acararatna, the Gotrapravararatna and other works. 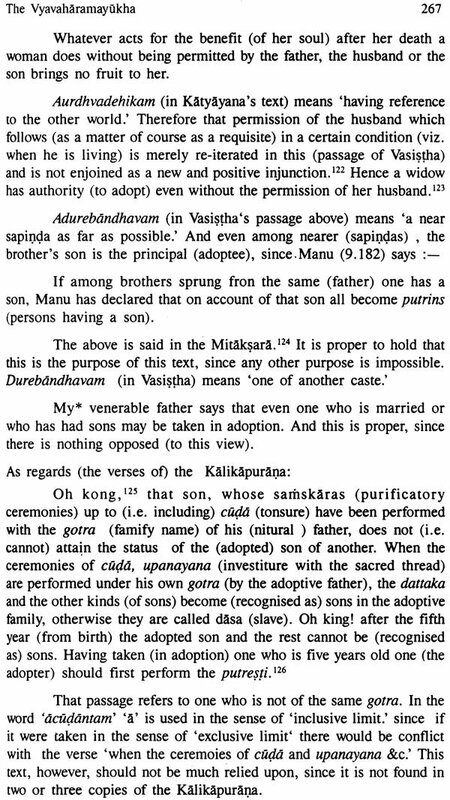 As the colophon to the Vyavaharatattva of Nilakantha shows, Sankarabhatta had four sons Ranganatha, Damodara, Nrsimha and Nilakantha, the last being the youngest. Dinakara alias Divakara had a son called Visvesvarabhatta or Gagabhatta, The latter officiated at the coronation of Shivaji, the founder of the Maratha Empire. He completed his father’s digest called Uddyota and wrote the Bhattacintarnani, the Kayasthadharrnadtpa, the Sivarkodaya and several other works.